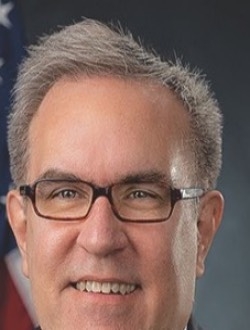 WASHINGTON — Andrew Wheeler has taken a step closer to becoming EPA administrator. The Republican-controlled Senate Environment and Public Works Committee last week approved his nomination to lead the EPA and advanced the nomination to the full chamber. Wheeler, a former lobbyist for the fossil fuel industry, has been acting administrator since July, when Scott Pruitt resigned under a cloud of allegations of ethics violations. He has continued the Trump administration's policy of dismantling many Obama-era environmental rules that conservatives say have stifled business without achieving large reductions in pollution. Chairman John Barrasso, R-Wyo., opened the committee meeting by saying that Wheeler "has done an outstanding job leading the EPA" so far. Sen. Shelley Moore Capito, R-W.Va., said Wheeler worked to improve transparency at the agency. Ranking member Tom Carper, D-Del., urged the Senate to slow the confirmation process to make sure Wheeler will lock in existing tailpipe emission standards for vehicles and toxic standards for coal-fired power plants, saying the nomination is still good for 183 days and should not be rushed. He repeated concerns that the EPA and NHTSA will essentially freeze fuel economy standards at the 2020 model year level and challenge California's authority to maintain stricter rules when automakers are begging for a single plan that doesn't fracture the market and throw their strategic plans into turmoil. Under the Trump proposal, which could be finalized within two months, the fleetwide average under test conditions would be about 37 mpg, compared with 47 mpg through 2025 under the Obama rule. Real-world mileage likely would be less.